Are you Having Problems with Any of These? If so, you need to come see me. 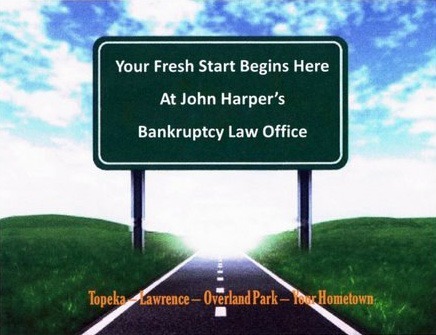 We help Kansas residents file for bankruptcy relief in and around Abilene, Atchison, Emporia, Junction City, Kansas City, Lawrence, Leavenworth, Lenexa, Manhattan, Olathe, Ottawa, Overland Park, Salina, Topeka and most anywhere else in NE Kansas under the Bankruptcy Code. Official Website has to say on this subject. Individuals can file bankruptcy without an attorney, which is called filing pro se. However, seeking the advice of a qualified attorney is strongly recommended because bankruptcy has long-term financial and legal outcomes. “Filing personal bankruptcy under Chapter 7 or Chapter 13 takes careful preparation and understanding of legal issues. Misunderstandings of the law or making mistakes in the process can affect your rights. Court employees and bankruptcy judges are prohibited by law from offering legal advice. The following is a list of ways your lawyer can help you with your case. Assist you with most aspects of your bankruptcy case. © 2016 John Harper's Bankruptcy Law Office. All rights reserved. Disclaimer: Information on this website is for informational purposes only. It does not constitute legal advice. Accessing this information does not establish an attorney-client relationship. You can become my client only by meeting with me in person and signing an agreement for legal service.